Experience a luxurious break at the Culloden Estate and Spa in Belfast with our best available B&B rate. 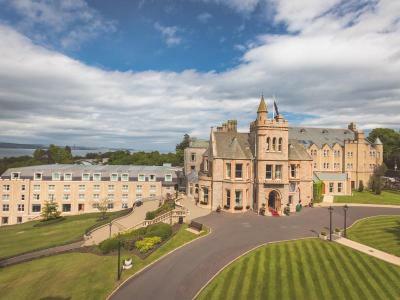 Standing high on standing in the foothills of the Holywood Hills, overlooking Belfast Lough the magnificent Culloden Estate and Spa is the most prestigious five-star hotel in Northern Ireland. With all its tranquil opulence, you could be forgiven for thinking the Culloden is a rural retreat, however this beautiful property has the added advantage of being close to Belfast City centre and conveniently located to many top visitor attractions so you can relax and explore the amazing city with all its history, culture, tradition and amazing sights.